No Superbowl party would be complete without buffalo sauce. Whether you slather it on your wings or use it in a dip, this spicy red sauce is a must-have. Ted Hall, from A Guy Who Loves to Cook, combines buffalo sauce with fried chicken tenders and tortillas to make these tasty buffalo chicken pinwheels. Each tortilla is spread with cream cheese before being rolled with the buffalo chicken, blue cheese, and chopped celery. 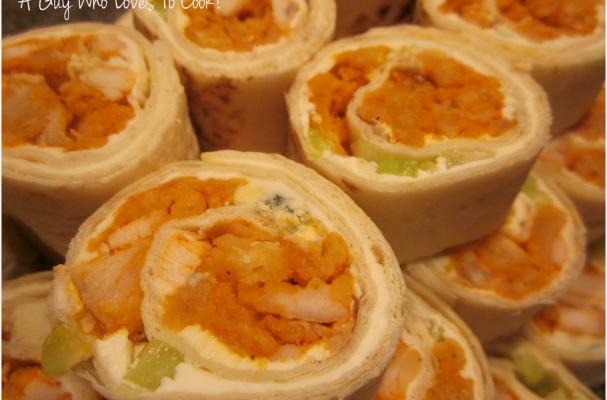 These buffalo chicken pinwheels are guaranteed to be devoured by game day spectators. Remove Cream Cheese from refrigerator and let come to room temperature. Spread Chicken Strips on a baking sheet and bake for 20 minutes, turning once halfway through the cooking time. Allow to cool for 10 minutes on baking sheet. Cut the cooled Chicken into ¼” dice and put into a bowl. Add ½ cup of the Buffalo Hot Sauce and stir to coat all of the diced Chicken. Cover and put in refrigerator for at least ½ hour. Assemble Pinwheels into logs by laying one Tortilla on the preparation surface. Spread 1½ ounces of the softened Cream Cheese over the entire top surface of the Tortilla. Beginning ½” from the edge nearest you, lay a 2” strip of the diced Chicken mixture across the Tortilla in a layer only one piece thick. Stop the strip about ½” from the right and left edges. At the furthest edge of the strip of Chicken, put a line of Blue Cheese crumbles only one crumble thick across the Tortilla. Next lay another strip of diced Chicken, this time 1” wide, across the Tortilla, followed by a ½” strip of the diced Celery. Finally, put 1 tablespoon of the additional Buffalo Hot Sauce in a bowl and use a brush to dab a ½” wide stripe of Buffalo Hot Sauce across the Tortilla, at the far edge of the strip of diced Celery. Gently press down on all of the fillings to set them into the Cream Cheese and tightly roll up the Tortilla beginning at the edge nearest you. The Cream Cheese without any fillings on top will serve to seal the finished log. As you complete each Tortilla, roll each log tightly in a sheet of plastic wrap. Make sure that the plastic wrap is at least 4 inches wider than the log so you can tuck the ends over to seal completely. Chill the wrapped logs for an hour to firm up. Stir the last 1 tablespoon of the Buffalo Hot Sauce into the Sour Cream with the Salt. Cover and allow to meld in refrigerator. Before serving, remove the plastic wrap and cut each log into one inch slices and arrange on a serving plate with the cut sides up to show the spiraling Pinwheel. Serve with the Sour Cream dipping sauce on the side.